Sawney Bean and his gory legacy sit with that of Countess Báthory when it comes to infamy and influence. It is a testament to the fear that the world outside of civilization held even during the Renaissance, when cities were rapidly beginning to build enough infrastructure between them to shelter traders and other members of society from the dangers of the archetypal woods and its predators and criminal element, and the sway it held on public consciousness led to the inspiration of several stories in the modern day. This is all quite possibly due to the sheer heights of its tale, and all the more impressive when it is considered that there is even less evidence to support its veracity than the account of Báthory’s murders. 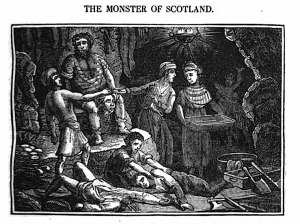 The story of Sawney Bean preys upon the macabre fear that may, in itself, be a dark reflection of the prevalent uses of corpses in Europe’s history, and is predicated on the same transgression that horrified the generation of Europeans that retold the salacious rumors of the countess: an impatience for people to die before devouring their corpses. An artist’s rendition of Sawney Bean in front of his cave, standing near one of his deceased victims. Posted on Wikimedia Commons, artist unknown. This amount of killing is staggering to consider, and also helps to further suggest the most-likely fictional nature of the Bean clan. Artist’s rendition of the gruesome rendering of corpses by the Bean clan., created by John Byfield and posted on Wikipedia Commons. 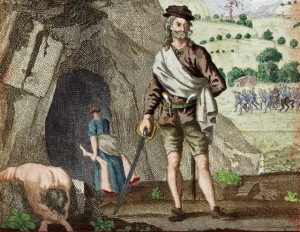 This lack of concrete evidence for his existence and suggestions to the exact opposite did not stop Sawney Bean’s story from standing the test of time and becoming a major influence on several stories in the present day. Wes Craven’s The Hills Have Eyes has a near-verbatim premise to the Sawney Bean legend aside from bringing in fears about nuclear testing and genetic testing, involving a family of cannibals living in a Southwestern desert that descend upon a vacationing family in a camper van. According to Bloody Disgusting, “[w]hile the obvious connective tissue is there (feral cannibal family), it was the treatment of the Bean Clan after their capture that proved interest to Craven. After finally being hunted down and arrested, the entire family was slowly tortured by burning, quartering, hanging, and more. The filmmaker was struck by the parallel between the cave-dwelling cannibals and the animalistic revenge meted out by more “civilized” people.” While Tobe Hooper’s The Texas Chainsaw Massacre is mostly inspired by Ed Gein, it is hard not to see the resemblance between it and this story. Once again, the movie involves a family of cannibals who prey on travelers. This trope has continued to appear in many stories over the years, and with notable examples appearing as recently in 2016 with shows like American Horror Story and in 2017 in a prequel to Texas Chainsaw, the legacy of Sawney Bean continues to this day with or without proof of his terrible attempt to support his family with the flesh and blood of the innocent.